Government of Pakistan has announced 18 New Jobs in Daily Jang Newspaper 18-03-2018 in Civil Aviation Authority Pakistan. Interested Candidates who have required Qualification/Experience may apply for Airport Jobs in Pakistan 2018 against the Title of Flight Inspector Helicopter, Senior Join Director Flight Calibration (Pilot), Cabin Safety Inspector, Senior Deputy Director I.T (Operations and Systems), Deputy Director I.T Aviation Center, Assistant Director I.T (in Data Center Operations, IT Security Auditor and IT Security Incident Responder) and Assistant Director Logistics. Candidates Are Directed to Visit www.caapakistan.com.pk to apply online for above Said Posts. 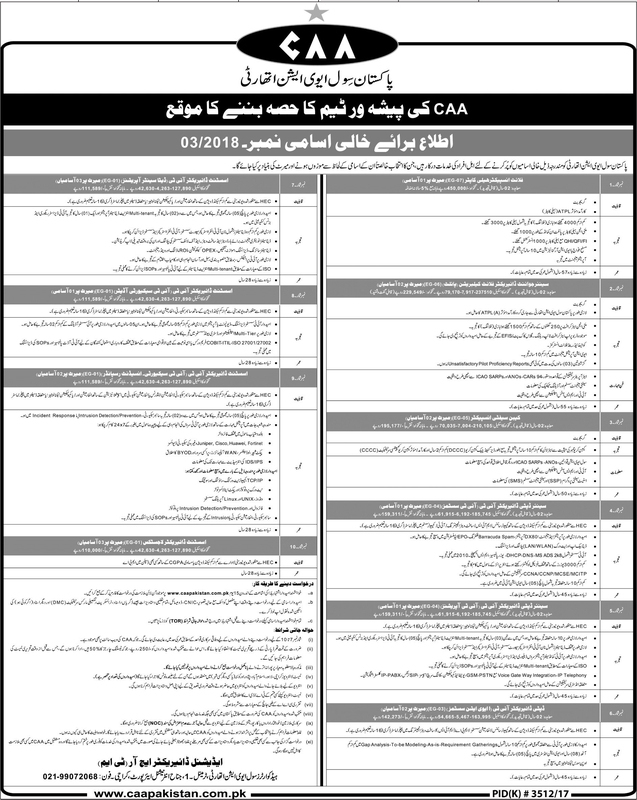 Civil Aviation Authority Pakistan 18 Jobs Daily Jang Newspaper 18 March 2018.